A very cold day doubtless contributed to fumbles, knocks-on, wayward passes and many, many penalties, but in amongst it all there was some quite brilliant, exciting and entertaining rugby football. Whilst overall the home team had the possession and the territory, Harrogate attacked when they could and brought the best out of ‘Ensians’ defence. The home side had the first score with a try by No.8 Matt Taylor converted by full back Kristian Keinhorst. Pythons converted a penalty and then a kick-and-chase gave them a favourable bounce for a score wide out. A beautiful conversion put the visitors in the lead at 8-7. Scrappy play and lots of mistakes caused the referee to speak to Harrogate about persistent offences. Play was error-strewn, but there was a great run by second row Ali Fothergill, winger Declan Jackson supported and crossed under the posts. A simple conversion for Keinhorst put the home side in front at 14-10 and some good running and handling by them was marred by a tendency to spill the ball and hand possession back to Pythons. Fly half Oly Eaves made a lovely break, ‘Ensians missed a penalty and half time came after another trademark Jackson run just failed to alter the scoreboard. 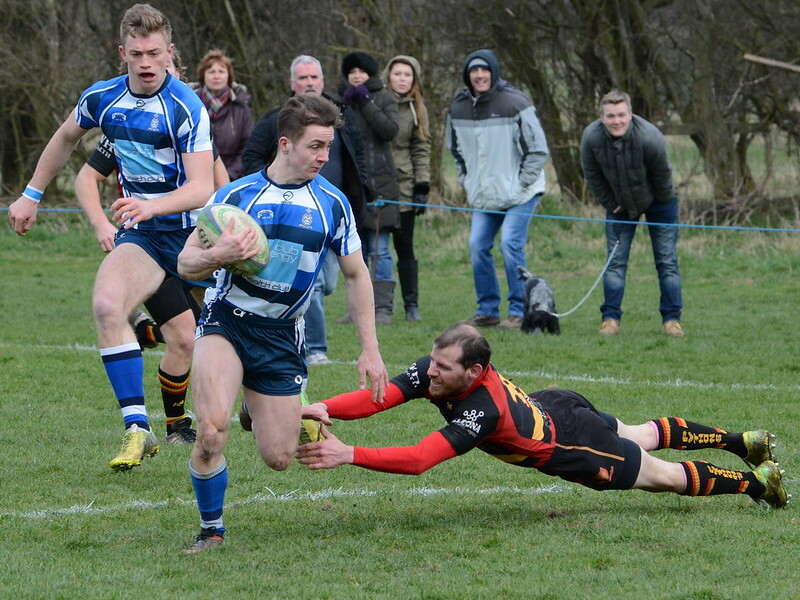 We had a (common sense) quick turnaround and after a Harrogate penalty to touch, ‘Ensians stole the lineout and superb handling by the threes gave winger Will Howarth some room which he used to great effect, first beating his opposite number and then taking on the fullback. Breaking the tackle, stumbling, regaining his balance, Will was over in the corner. Keinhorst struck the conversion perfectly to move the score up to 21-10.
ythons suddenly took possession and phase after phase brought them right back into the game and into opposition territory. They were swarming all over the men in blue and were quickly rewarded with a try wide out. No conversion left the score at 35-18, but ‘Ensians immediately seized control again. After losing a line out in the corner, Sam Featherstone took the next one “off the top” and good hands through the threes gave Jackson his second try in the corner. Keinhorst’s kick struck an upright; 40-18. From the restart, Harrogate attacked, but Fothergill brought off a great cover tackle and play once again returned to the Pythons’ 22. Featherstone won the next line out and, again, the threes executed play perfectly for Jackson to record his try hat trick. Keinhorst’s seventh conversion gave the final score a handsome look at 47-18. Harrogate were brave and indeed adventurous, but in the end well beaten. ‘Ensians squad from one to sixteen were individually and collectively on form and it was good to see them tackling and defending for each other, taking balls against the head, and all running with pace and purpose. Luke Cowdell looked to be returning to his best form and enjoying breaking tackles and running well; Dom Oddy just slots in seamlessly and does the right things at the right time. We can’t omit the front row; strong in the set piece, strong with ball in hand, strong in the tackle, Jones and Dyson times two take justified delight in “stealing against the head”. Full afternoon’s coverage of the 6 Nations made the crowd much thinner than usual, but “your correspondent” watched the recordings later and was thus rewarded with four outstanding games of open, exciting rugby. Very cold it was at Chaffer’s Field, but very much worthwhile!